When you travel with a laptop, your keyboard normally takes a step back in quality. With a few exceptions, even notebooks with good keyboards aren’t as good as the mechanical ones on a desktop . Cooler Master’s new SK30 and SK640 keyboards offer the comfort, efficiency, and RGB awesomeness you have at your home desktop. More so, the keyboards are lightweight and fit comfortably in any bag. Cooler Master SK series. Source: Reddit. The full-size SK650 goes for a price of around $139, while the tenkeyless SK630 goes for around $119. The keyboards are light enough to fit in narrow laptop bags. They are also super thin because their Cherry MX Low Profile Red switches are flat. However, the style leads to a unique key feel not everyone may like. Besides the number of keys and exact dimensions, the SK650 and the SK630 are almost identical. Both keyboards have flat, chiclet-style keys sitting atop a brushed, silver aluminum base. The base has a neat chamfered edges and a dark plastic bottom. To maintain a compact form, the keyboards have no margin between the keys and the edge. While the typing feel is not the best, the keyboards are great for gaming. In fact, I recommend the keyboards for any gaming PC build. The light show is spectacular. The SK650 and the SK630 have 19 different LED color modes. Modes range from static (a single color) to Rainbow Wave to Breathing. Most animations are customizable so that you may choose the color, direction, and other properties. There are various modes at which the color animation react to your key presses. For example, Reactive Punch light up the keys near the ones you have pressed for a few seconds. The most exciting mode is probably System Status, which allows the keyboard to light up based on CPU Load or music playback. 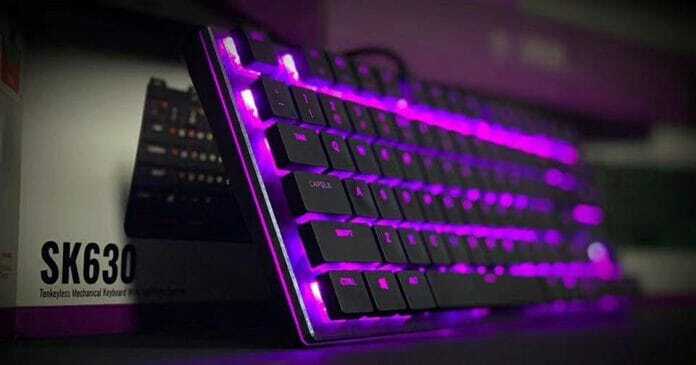 These functions are available by hitting the function key (the one with the Cooler master logo) and some combination of the function row keys.